Another Pike concession was the Moorish Palace. 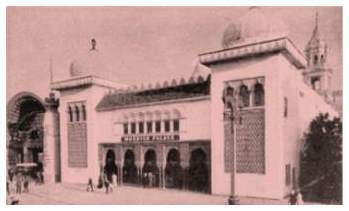 This exhibit included historical wax work and plastic exhibits from Madam Tousard's Wax Museum in London, as well as a Sultan's Harem Room. Costumes and dresses showcased the Muslim people of the southwest Africa. A visitor could see large tableaux depicting the acquisition of the Louisiana Territory, discovery of Mississippi, burial of De Soto, transfer of Louisiana, and Lewis and Clark's expedition. A theater showed Moorish acrobats, jugglers and magicians. Plastic Art was shown in the attraction. Besides street performers such as snake charmers, there were many venders booth that sold exotic rugs, linens, and jewelry. The attraction did not make as much money as it cost to build. One possible reason might be that the Moorish Palace concession was also at 1893 Chicago World's Fair. Another reason could be of competition between the `Streets of Cairo,' `Jerusalem,' `Mysterious Asia,' and `Constantinople' exhibits also on the Pike.